Baked goods aren't exactly my forte. But in the spirit of Mad Men Sunday nights, I wanted to bake a retro-inspired dessert to end cap our weekend. While I can't claim that my creation is healthy per se, I did update the ingredients in the original recipe for upside-down cake to reflect a modern perspective. Betty may have used cisco, I opted for organic coconut oil. I used almond milk instead of skim and organic whole cane sugar instead of the granulated variety. And lastly, I used organic ingredients as noted blow. 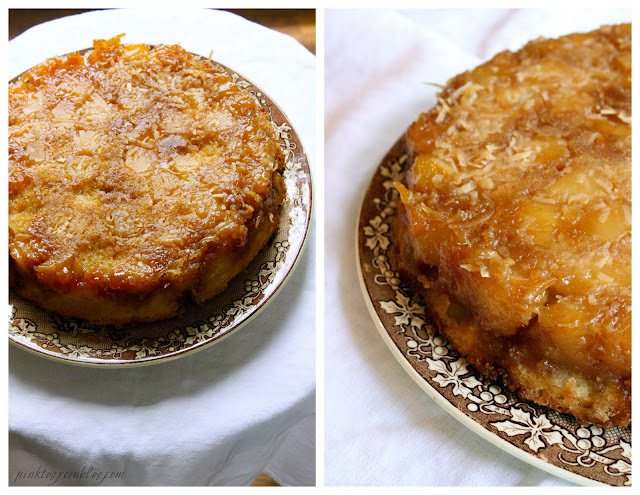 The result was still a gooey coconut and pineapple topping and a moist cake underneath. 4) Beat remaining 5 tablespoons of butter in a bowl until fluffy. Beat in sugar, egg and vanilla. 5) Add flour mixture to beaten butter alternatively with milk. Then pour batter into cake pan. 6) Bake about 40 minutes then cool on wire rack for about 10 minutes. Then turnout cake onto serving platter. Serve warm or cool, with or without favorite toppings. My grandmothers signature dessert was pineapple upside cake! I've never attempted it but it looks like you did a great job! I love pineapple cake! And adding cococut- yes please!